This September over a dozen nurses from Delaware, Maryland, Michigan, New Hampshire, Oregon, Pennsylvania, Texas, and Virginia came together to advocate for H.R. 1651 and S. 1106 The National Nurse Act. These advocates stormed Capitol Hill, making over 50 Congressional office visits in just 2.5 days! Thanks to these dedicated advocates’ continued perseverance and hard work, there are now 60 co-sponsors for H.R. 1651 and 3 co-sponsors for S. 1106. Both bills are equally supported by Republicans and Democrats. Below are some pictures that illustrate the tremendous progress achieved for this important and timely legislation. 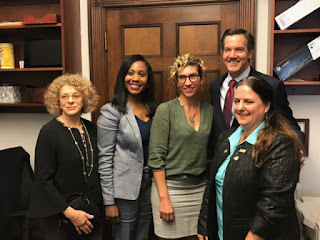 The meeting with Representative Evan Jenkins (WV-3-R) was a smashing success thanks to the teamwork of NNNO Advocacy Team members Joan Westgor MSN, RN, CCM and Michelle Berkley Brown MSN, CNP who joined NNNO Vice President Elizabeth McPhee RN and Beth Baldwin APRN, PNP, BC Immediate Past President of the West Virginia Nurses Association. The entire West Virginia House Congressional delegation are now co-sponsors of H.R. 1651, The National Nurse Act. Thank-you Rep. Jenkins for supporting nurses. NNNO Advocacy Team Member Betsy Konrad MSN, RN-BC, CNL, PHN and daughter Callista visited the Congressional district office of Representative Jackie Speier (CA-14-D) on a hot August day to advocate for the National Nurse Act. Thank-you Rep. Speier for your continued support! Our entire team is extremely proud to announce the co-sponsorship of Senator Bernie Sanders (I-VT). His health aides have worked alongside our team for several years, providing suggestions and assistance that have advanced the National Nurse Act. Senator Sanders is a leader of the Senate HELP Committee. We are grateful to Senator Sanders for his support.